The halls of Hillside High School were packed with administrators, educators and endless opportunity on April 6. 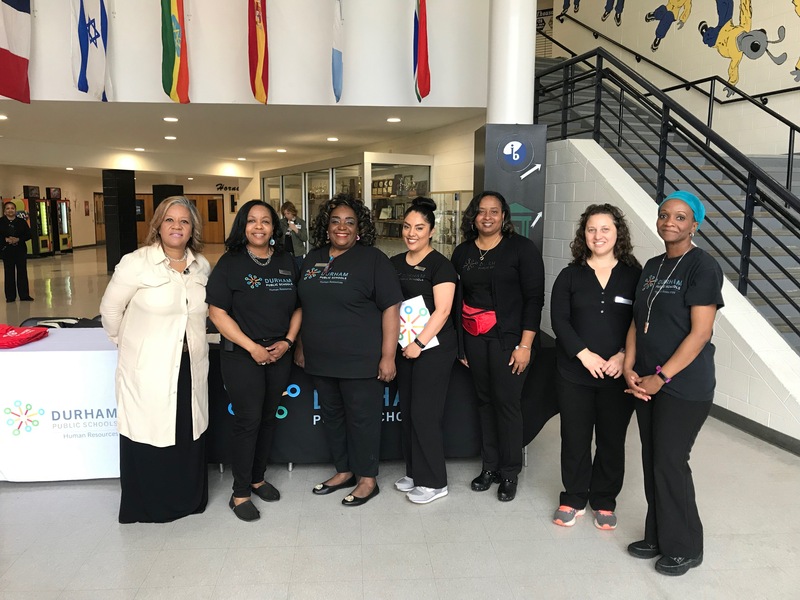 Fifty-three schools in the Durham Public Schools system gathered at Hillside High School for the annual Teacher Career and Transfer Fair, a community-wide event for individuals to explore employment opportunities. All grade levels and subject areas are involved, including the English as a Second Language and the Academically or Intellectually Gifted departments. The event is part of the School Superintendent Pascal Mubenga’s vision for the school district, said Regina Nickson, Durham Public Schools human resource administrator. Durham Public Schools hosted the annual North Central Regional Educational Job Fair in March. The regional fair was also available to surrounding school districts and attracted about 250 candidates this year. The summer is the school district’s peak time for staffing, Nickson said. The career fair gives the process an early start. “They are interviewing, and there are people walking away with early contracts today,” Nickson said. 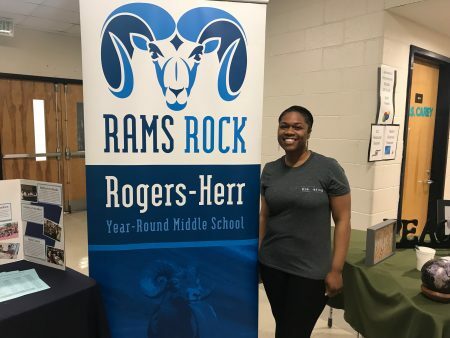 One of the schools recruiting teachers for the next school year is Rogers-Herr Middle School, a year-round school in Durham. “We look for quality, passion with kids and someone who can build effective relationships with them, because that’s where it all begins,” said Tyler Albright, the principal intern of Rogers-Herr Middle School. Keaundra Robinson, an eighth-grade language arts teacher at Rogers-Herr Middle School, said she experienced this relationship as a student, and it inspired her to pursue teaching. The fair also included vendors like Barnes and Noble and leasing apartment agencies for those coming from outside of Durham. Some educators already working in the school district attended the event to find new ways to enhance their work. 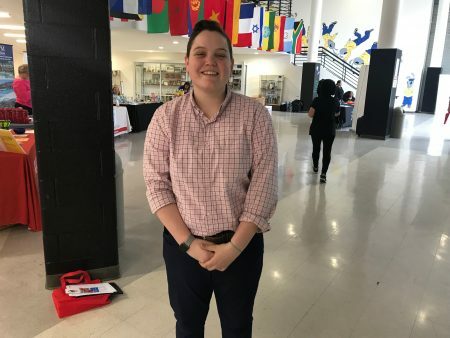 Morgan Githmark, a 23-year-old from Charlotte, is a seventh-grade English teacher at Maureen Joy Charter School in Durham. She attended the job fair to see all the opportunities the school district has to offer. Githmark said teachers have the power to influence the upcoming generation in countless ways. Nickson said the district leaders are trying to build a more diverse team of educators to reflect the growing student population. Earlier this year, a recruiter and teacher for the school district, Victor Hiraldo, traveled to Puerto Rico to help recruit bilingual teachers. Kimberly Hager, a senior executive director of human resources for Durham Public Schools, said 31% of the school district’s student population identifies as Hispanic/Latino. Nickson said the school district has struggled with state funding and charter school funding. By improving the teaching environment for educators and administrators, Nickson is certain the district as a whole will be strengthened over time. Diane Adame, a UNC-CH senior majoring in journalism, is from Modesto, Calif. This semester she is serving as a staff writer for the Durham VOICE. Elisabeth Beauchamp, a UNC-CH junior majoring in journalism, is from Advance, and is a staff writer for the Durham VOICE.